At BE Structural, our goal is to find unique structural engineering and design projects so when we were presented with the opportunity to engineer a trampoline park, we jumped at the chance! In 2013, BE Structural added trampoline and ninja obstacle courses to our non-traditional project portfolio. 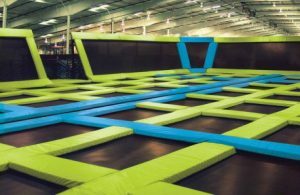 We partnered with a national trampoline park installer to design and engineer an indoor trampoline system configured as an obstacle course for a new, Mid Atlantic location. The structure was designed to offer two patrons the ability to run the course and compete against each other. Any time a client brings us a non-traditional engineering opportunity, we must consider their value proposition and how we can meet their needs without compromising life and safety. This is especially true for the entertainment industry! At BE Structural, our team believes in making our clients’ products safer, more accessible and more exciting for their customers. We welcome the challenge. Our team takes on these types of projects because we love amusement parks, water slides and trampolines. We are athletes, thrill seekers and extreme sport weekend warriors. We stay ahead of the curve and engineer outside the box.